Published by Piccadilly Books, Ltd. This weight loss plan actually encourages the consumption of fat on a daily basis. The low fat or low calorie diet that you are on is the reason why your weight loss has been slow, or non-existent. Fat is an essential nutrient; the human body needs a certain amount of it every day. It helps to slow down food in your digestive system so that it can be absorbed. Besides, food producers will add chemicals to make up for the fat or calories that have been removed, chemicals that are even less healthy than fat. Your whole thyroid system may be malfunctioning, not just your thyroid gland, which the usual thyroid blood test may not pick up. The problem may be an iodine deficiency, or chemicals like fluorine, chlorine and bromine that are in your tap water. Take your temperature several times during the day. If it is chronically more than 0.3 degrees low, that may indicate a thyroid or metabolism problem. How can a person stimulate their metabolism? Drink lots of water, get regular exercise and exposure to sunlight, eat a wholesome diet, consume coconut oil and add cayenne pepper to the diet. What about this coconut ketogenic diet? The two most important parts of it are to greatly reduce, or eliminate, your consumption of carbohydrates, and have three tablespoons of coconut oil with each meal. If your body tells you to start with one tablespoon per meal and work your way up from there, that’s fine. The book has a list of the carbohydrate content in fruits, vegetables and breads, along with a chart showing desired body weight. The explains why coconut oil (also known as medium chain triglycerides) are so healthy. This is an excellent book. It is not the usual “diet,” where the dieter is limited to certain foods. If all a person can do is greatly reduce their carbohydrate consumption, and do a lot more exercising, without doing anything else, that can only help. This book is recommended for everyone, with and without a weight problem. 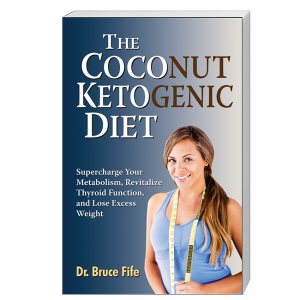 Click here to learn more about The Coconut Ketogenic Diet.